Efficiency ratings for wire rope end terminations are based upon the catalog breaking strength of wire rope. The efficiency rating of a properly prepared loop or thimble-eye termination for clip sizes 1/8˝ through 7/8˝ is 80%, and for sizes 1˝ through 3-1/2˝ is 90%. 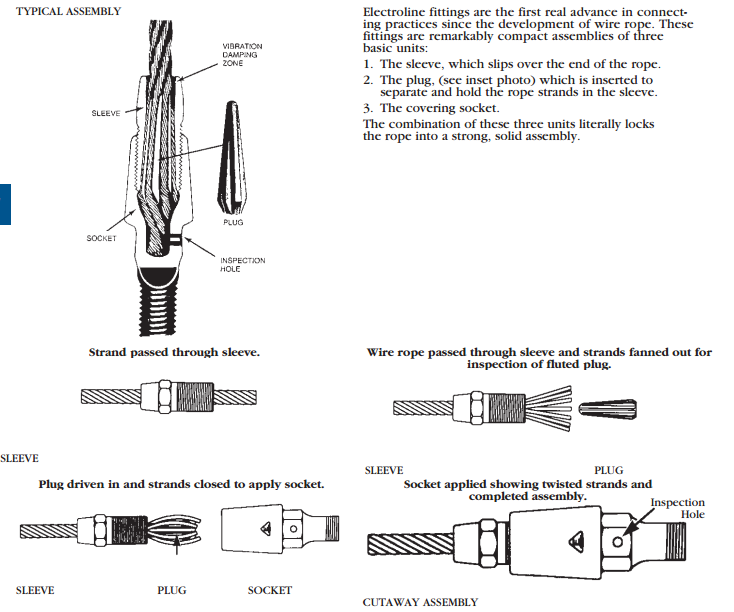 The number of clips shown (see Table 1) is based upon using RRL or RLL wire rope, 6 x 19 or 6 x 37 Class, FC or IWRC; IPS or XIP. If Seale construction or similar large outer wire type construction in the 6 x 19 Class is to be used for sizes 1˝ and larger, add one additional clip. If a pulley (sheave) is used for turning back the wire rope, add one additional clip. Please download our full wire rope terminations specification PDF for more information on application instructions for U-bolt clips. At CERTEX, safety and proper application is an extremely important facet to any job. The proper attachment of terminations to ropes should be completed with the necessary skill, knowledge, and equipment to make sure the load can be effectively transferred from the rope to the termination. Crosby clips are a type of clip for wire rope terminations and each base is stamped with a product identification code. The clips have different sizes and have forged bases. All the clips are also individually bagged or tagged with proper application instructions and warning information.